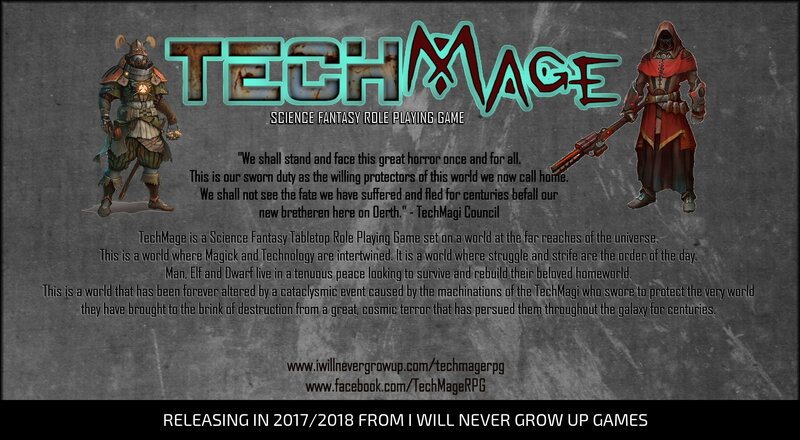 The TechMage Science Fantasy RPG has not been forgotten! The framework of the TechMage RPG is complete, the story is ready to release and the game play is solid. Artwork, however, is a massive undertaking! We have been in contact with the artist who created the amazing TechMage character illustrations seen in our promotional items and he is more than happy to create more illustrations for the game, however considering the staggering amount of artwork required for the scope of this not-so-little RPG, this could take quite some time! We have to provide specs for each illustration and with the number of illustrations we are looking at (well over 100 at this point) that alone is a job unto itself. As such, we are considering the possibility of pre-releasing the TechMage RPG without art assets (we will include some maps and minimal artwork) at a lower price point prior to a full launch some time in 2017. Please check back for more information as we continue working to get this product to the end user!